While China and the United States are edging closer to a trade deal to end their protracted tariff war, the mutual distrust and geopolitical rivalry between the world’s top two economies appears to be escalating. Squabbles over China’s growing influence in Latin America and the Caribbean broke out again after Beijing last week secured Jamaica’s official endorsement of its vast “Belt and Road Initiative”. Beijing’s political and economic inroads into countries deemed to be America’s backyard have apparently unnerved Washington, with Secretary of State Mike Pompeo ramping up his criticism of China in the past few days. During a four-nation tour of Latin America, the top US diplomat focused heavily on China’s role in Venezuela and growing economic reach in the region, accusing Beijing of injecting predatory, corrosive capital to buy off corrupt leaders and playing a long game against Washington’s interests. Analysts said Pompeo’s remarks on China showed that the progress reportedly achieved on the trade dispute would not extend to other tensions in bilateral ties, and the two countries remained on a collision course in the long run. “With China’s continuous rise and its desire to reclaim its greatness on the world stage, the competition and even confrontation with the US are almost inevitable, with Latin America becoming the latest battleground,” said Huang Jing, a professor at Beijing Language and Culture University’s Institute of International and Regional Studies. 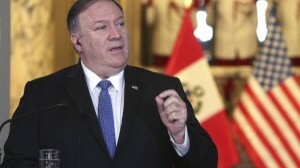 During his stop in Santiago on Friday, Pompeo said the Chilean authorities shared the same concerns with Washington about China’s influence. “China’s trade activities often are deeply connected to their national security mission, their technological goals, their desire to steal intellectual property, to have forced technology transfer, to engage in activity that is not economic,” he said. “If China shows up to compete on a commercial basis, that seems perfectly reasonable,” he said in an interview with the Voice of America while in Paraguay, the only South American country that does not have diplomatic ties with Beijing, on Saturday. “When they show up with malign intent, to give money with strings attached, which will destroy the sovereignty of a South American nation, that is not good for the people in that country, and the US is prepared to help those countries recognise that threat and to offer alternatives to it,” he said. “We don’t want China to show up with bags full of money and bribe officials. We don’t want China to show up and put Huawei or Chinese technology into the infrastructure of these countries so that the citizens, the citizens of Chile or the citizens of Paraguay, have their information, their private information, stolen by the Chinese government. We don’t want corrupt activity,” he said. Describing Beijing as a pretend friend of Latin America, Pompeo also criticised China’s role in propping up Venezuela’s embattled leader Nicolas Maduro during the trip. “China’s bankrolling of the Maduro regime helped precipitate and prolong the crisis in that country,” Pompeo said on Friday, adding that China had invested over $60 billion through oil-for-loan deals in the past decade. His remarks came as Washington has become increasingly sensitive about Beijing’s inroads into the region amid US President Donald Trump’s trade war with China and escalating rivalry over technological supremacy among other geopolitical tensions. Countering China’s global ambitions also topped the agenda of Brazil’s right-wing president Jair Bolsonaro’s White House meeting with Trump last month. “Based on my observations of the triangular relations between China, the US and Latin America in the past decade, Washington’s wariness of China’s expanding presence is on a rapid rise,” said Jiang Shixue, director of the Centre for Latin American Studies at Shanghai University. Dong Jingsheng, deputy director of Peking University’s Latin America Research Centre, also noted Pompeo’s remarks were in line with the growing antagonism and hostility towards China in Washington. While Beijing had insisted it did not intend to displace Washington’s dominance around the globe, he said it was understandable the US felt unsettled by a rising China, which is now the largest trading partner and investor for many countries in Latin America and the Caribbean. “With China-US relations sinking to a historical low and tensions spiralling beyond trade rifts, it is natural to see the ratcheting up of ‘China threat’ narratives in the US and other regions,” Dong said. Both Dong and Huang also noted that — like most official dialogue channels between China and the US — their formal consultation mechanism on Latin American affairs had been suspended under Trump. Huang said there was an acute sense of insecurity among political elites in Washington over China’s rise, which had led to efforts to forge an alliance to confront Beijing amid America’s perceived decline and withdrawal from its global leadership role under Trump’s “America First” policy. “Unlike Trump, Pompeo represented the majority view of the Republican establishment and his hawkish and sometimes rather emotional remarks on China have to be taken seriously,” he said. Experts also cautioned that China’s investments and political ties with Latin American countries could be affected by Washington’s diplomatic efforts targeting Beijing. “With the US entering another cycle of its presidential elections soon, it is very likely that both countries will continue to wrangle over a litany of bilateral and geopolitical issues, with bilateral ties in limbo for a long time,” Huang said.